Mardelle Mahariel made one request of the king: give the Dalish lands and put an end to the poor treatment of elves within the city. Alistair had seen the alienage well enough to know something had to be done without her telling him so. He honoured his word and Mardelle returned to Ostagar to help the Dalish clans and alienage elves settle. She became First to Lanaya, her apprenticeship enhanced greatly by her experiences. Mardelle worried that Zevran would be bored remaining with her, but settling a nomadic people into new lands occupied far more time than either of them expected. Not to mention her duties as a Grey Warden had not diminished quite as much as she thought they would. The death of the Archdemon had inspired a surge in interest in the Grey Wardens and the King had granted them a new Keep. The Orlais Wardens aided in recruitment and the Joinings and ranks swelled. Many excursions were made into the Deep Roads to aid the Legion of the Dead in the culling of the Darkspawn hordes. Though not a Grey Warden, Zevran never passed up an opportunity to remain at Mardelle’s side and soon enough, he was rewarded with her kisses once again. Unfortunately, Mardelle suffered the loss of her left hand on one such mission to the Deep Roads. No longer able to use her bow, she became depressed and sedentary, listlessly going about her duties as First to Lanaya and ignoring summons from the Grey Wardens. Zevran went to the King, who made a suggestion that he hoped would help Mardelle as much as it would help him: Find Morrigan. Alistair gifted Mardelle with a modified bow that worked with her maimed arm. She hesitantly accepted both the mission and the bow, but with Zevran’s persistence, her spirits eventually lifted and in time, they did find Morrigan, though not the child. They allowed Morrigan to pass through the eluvian and after sending a message to the king, decided to continue their adventure, traveling to Antiva, where they were married in a lavish affair. As expected, they found themselves in trouble with the Crows, and escaped to Kirkwall, where they learned Mardelle's clan was residing. They traveled up Sundermount, only to find that the Keeper had left to stop Merrill from unleashing a demon. Mardelle and Zevran arrived too late to save Keeper, who bestowed her title on Mardelle before she died. 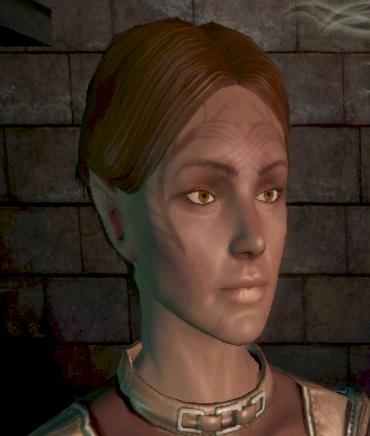 Mardelle condemned Merrill and took the Sabrae clan back to Ferelden on Alistair's ship. When they arrived, they discovered that serious problems had arisen between the Dalish and the humans near their settlement. Lanaya’s pleas to the King's court had gone largely unheard during Alistair's absence. Furious, Mardelle confronted Alistair, demanding he deal with the situation. Unfortunately, his attention had already turned to the grave issues with the Circle of Magi and the Chantry. While Mardelle was at court, a battle broke out between the Dalish and the humans, resulting in the death of Lanaya. When word reached them, Mardelle and Zevran flew to Ostagar and exacted revenge, killing many humans. The incident caused a great rift between Mardelle and Alistair. She became Keeper to the remaining Dalish and they became wanderers once again. Many years later, the Clan received a visitor. Wynne, still miraculously alive, delivered a message from Alistair to the Keeper. Zevran’s pleas, Wynne’s wise counsel and the Calling convinced Mardelle to heed Alistair’s request to meet him at Soldier’s Keep, where Avernus shared with them the results of his years of research: he had finally learned how to prevent the taint from overtaking the Grey Wardens, but he needed to test his ritual on live subjects. By this time, Alistair had a queen and an heir and Mardelle had a capable First. They agreed to be the subjects of this test, knowing that either way, their time had come. The ritual worked and the knowledge was passed on to the Grey Warden Commanders. In the thirtieth year following their Joinings, the Keeper and the King ventured into the Deep Roads to stand against the Darkspawn. And they did this every year thereafter.